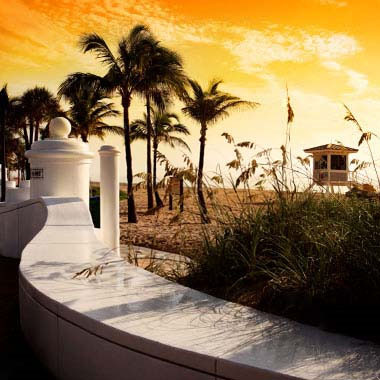 Known as the "Venice of America," Fort Lauderdale is one of the three primary cities in the South Florida metro area, boasting a population of over 180,000. The city gets its nickname from its intricate canal system and waterways. The waterways are such a major part of being a Fort Lauderdale resident, that the city has over 100 marinas and boatyards and over 40,000 resident yachts. In short, if boating is your thing, Ft. Lauderdale is your city! As the city's name implies, Fort Lauderdale was initially founded as a series of forts during the Seminole Wars of the 1830s. The name "Lauderdale" is derrived from Major William Lauderdale, the commander who built the first fort in the area. The city is zoned in between Interstate 95 to the west and Federal Highway to the East, with Commercial and Davie Boulevards bordering Ft. Lauderdale to the north and south. The Florida East Coast Railway runs right through the center of the city. Neighborhoods in Ft. Lauderdale include Bahia Mar, Bay Colony, Browardale, Chula Vista Isles, Dolphin Isles, Galt Ocean Mile, Golden Heights, Idlewyld, Inverrary, Las Olas, Melrose Park, Poinsettia Heights, Rio Vista, Riverland Village, Rock Island, Roosevelt Gardens, Sailboat Bend, Tarpon River, Twin Lakes North and Victoria Park. Ft. Lauderdale locals moving to or from South Florida, Moving On Up™ has got you covered. We are proud members of the American Moving and Storage Association (AMSA) and the Better Business Bureau. Our moving company performs same-day local moves for relocation anywhere within a 250 miles radius of Greater Fort Lauderdale. Call us now at 1-800-945-9569 to speak to a moving consultant for more information. Plan your South Florida regional relocation by visiting our Local Moves and moving promotions pages. Check out Broward County's site for an A-Z Guide of living in Broward. If your move is in the Greater Ft. Lauderdale area, visit FTL's official site for information on community, business and leisure. Moving On Up™ is conveniently located in South Broward and able to help you with any moving needs. Give us a call at (954) 924-1522 to schedule an in-home estimate or book your move. Request a moving quote and get a FREE in-home visual estimate for an accurate, binding price.